After demonstrating the appearance of serious illness for many months Kirti Tsenshab Rinpoche entered tukdam, the final meditation, at 2.30am, Saturday 16th December 2006 in South Delhi, India. The day of the 15th, which was Lama Tsongkapa Day – one of the holiest days in the Geluk callendar- , special offerings and prayers were offered at the house and in the evening extensive light offerings were made. Rinpoche’s holy body was taken to Dharamsala on Thursday night and it was kept in public display in Rinpoche’s room at Kirti Gompa (in Mcleod Ganj, India) for three days prior to the cremation. Many Tibetans and some Western students who were able to make the trip to Dharamsala made offerings to Rinpoche’s holy body that was in the laying posture covered with his yellow ceremonial robe. I had received numerous emails asking me to offer a last khata, so I decided to offer one khata for each country Rinpoche visited, including Antarctica and its penguins. I also offered one khata for all the places Rinpoche did not visit in this life. When I entered Rinpoche and Alak’s room I was struck by how many items were there collected from all over the world: a set of walki-talki from California, a traditionally hand painted little box from Russia, pictures from Rio de Janeiro next to some old pictures of the Dalai Lama among Nerhu and Indira Gandhi, a water bottle in the shape of Mother Mary from Mexico, a toy woolen lamb from New Zealand, a picture of Ayers rock from Australia, a bath mat with dolphins from Puerto Rico, shopping bags from Athens, certificates from the boat that took Rinpoche and Alak to Antarctica, a stupa from France, tsa-tsas from Taiwan, fridge magnets from South Africa, a sweater from Colombia, a camera bought in Washington DC., a pair of crocs from Israel and so on. Rinpoche and Alak have been in so many places, connecting with so many students around the world. The cremation site below the Tibetan Childrens Village had been prepared for the ceremony and a temporary brick stupa was erected for the cremation. When they were digging the ground in preparation for the stupa they unearthed some Nepali coins featuring a stupa and a vajra and everyone interpreted that as a very auspicious sign of stability. Early on the morning of December 25th Rinpoche’s holy body was placed in the full lotus posture, dressed in brocade, adorned with the crown of the five dhyani buddhas, and his face covered with red silk. The body accompanied by the same monks who took care of Rinpoche during the last six months was taken from his residence at 5.30am and was carried to the cremation site. Rinpoche’s holy body was then placed on a throne and people had the opportunity to offer a khata for the last time. When that was done, the same group of monks circumambulated the cremation stupa carrying Rinpoche’s holy body and they finally lowered it into the stupa. Monks from Namgyal Monastery performed the Kalachakra fire puja while at the same time monks from Kirti Monastery recited the prayers of refuge and bodhichita, the King of Prayers, Lama Choepa tsog, and so forth. The fire was lit and soon smoke and flames emerged. Once the ceremony was over the stupa was covered and the fire was left burning till Saturday Dec 30th when the stupa was opened again. 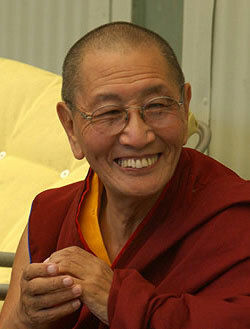 The relics were collected and placed in a specially prepared vase and then taken down to Rinpoche’s room once again. In the meanwhile all signs were carefully recorded. An elder monk from Ling Labrang who specializes in interpreting signs appearing at the cremation was invited to participate. He commented that there were a lot of auspicious signs but also a number of signs that he had never seen before and therefore could not interpret at the moment. Rinpoche’s relics will be kept in the vase until a proper relic stupa is constructed however it was not seen necessary to erect a permanent stupa at the cremation site. A lot of people are asking for the translation of the Prayer for the Quick Return of the Reincarnation. The prayer will be coming soon.